Editor’s Note – Foraging is one of the best ways you can get started yardfarming. It requires no yardspace or special tools — just an adventurous walk through nature while keeping your eyes peeled for delicious, wild plants. Below are some tips to help you get started. This article + infographic was originally posted on FIX.com and written by Mannfred Boehm. Consider this: we’re the first species on planet Earth to get our food from grocery stores. Before modern supermarkets, humans grew their own food either as a living or to supplement food bought at the market. Even before that, we were foragers – or “hunter gatherers.” Just because it’s no longer necessary, the practice of foraging doesn’t have to disappear completely. By collecting edible plants from various natural terrains, you can supplement your diet with tasty, organic wild food! Foraging for food is an ancient activity that our ancestors did from necessity. Today, foraging is mainly done for fun! An added benefit of foraging is the ability to incorporate otherwise-scarce nutrients into our modern diet. Foraging for edible plants can be a great reason to get outside, socialize, and learn more about wild environments, and it comes with the satisfaction of sourcing your own food. Here are a few of the basics of foraging; master these three edible plants, and you’ll be hooked! Yes, that’s right, dandelion. This plant, which can be found in almost any environment, is usually thought of as a pesky weed. 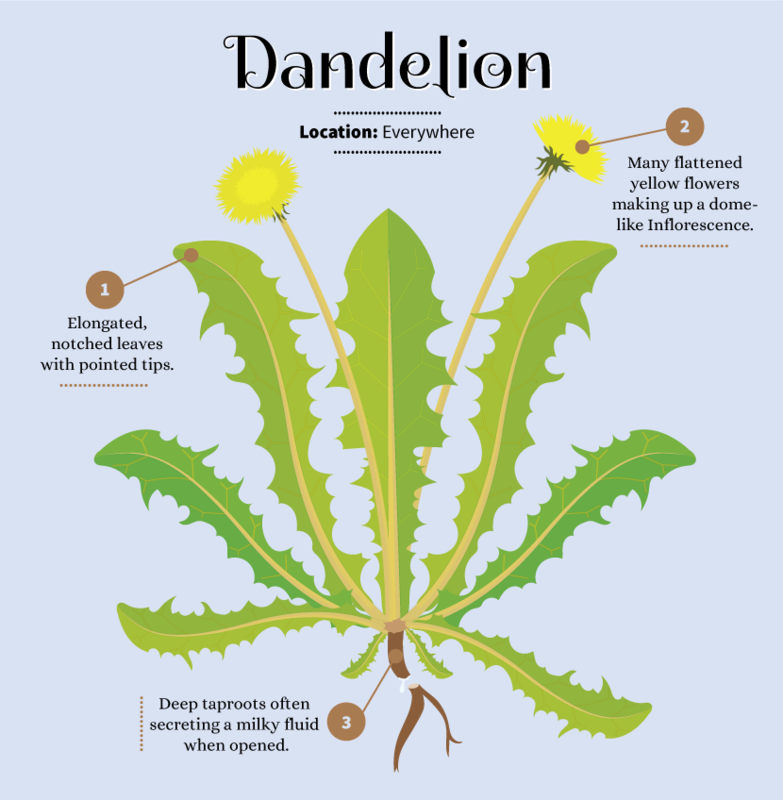 Collecting dandelions is a good place to start on your foraging expeditions because they are relatively easy to find and identify. The leaves, stems, roots, and flowers are all edible, though some prefer certain parts over others. They may seem bitter to newly initiated taste buds, but as a little incentive, dandelions are chock-full of antioxidants and are deeply rich in Vitamins A and K as well as fibre. Most find that the bitterness decreases with experience. It’s an acquired taste, if you will. 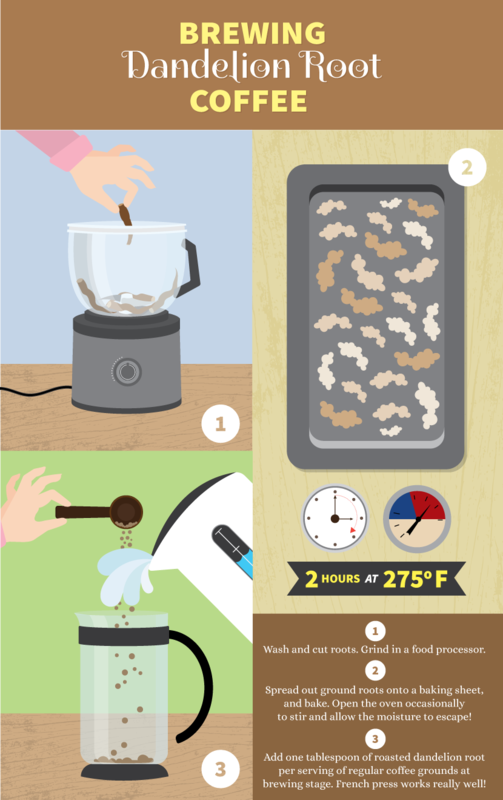 To prepare roasted dandelion root coffee, wash, cut, and grind the roots in a food processor. Spread the ground roots onto a baking sheet, and bake them at 275°F for about 2 hours. Open the oven occasionally to stir the roots and allow the moisture to escape! Once the roots have dried and roasted to a dark brown, they’re ready for brewing! Adding about a tablespoon to a cup of your desired coffee makes a tasty, unique, roasted dandelion brew. This is another widely distributed plant found near rivers, disturbed habitats (such as footpaths), and anywhere else with shade and rich soil. These plants are often called stinging nettles because the leaves and stems are covered in irritating hairs. Beginners will want to wear gloves until they feel confident handling this plant barehanded! Despite its name, this plant has been used in traditional European and Asian medicine for centuries, and it is still revered for its high vitamin A, calcium, iron, and protein content. Because the hairs can be irritating, preparing nettles requires drying or cooking; after that, they make a fantastic addition to soups and salads. You can even brew the dried leaves for a medicinal tea. 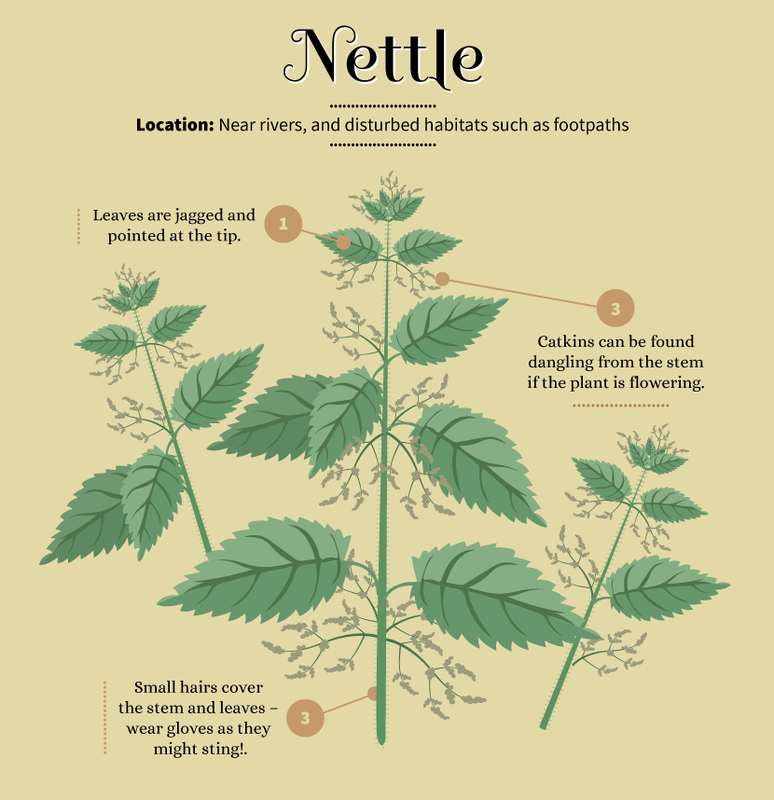 Nettles are not exactly a showy plant, so you may need a keen eye at first to find them – though one quickly develops an intuition after the first few sightings! Look for a plant 1–2 meters in height with toothed leaves and deep veins. If the plant is flowering, it will have catkins hanging from its canopy. The best tasting, most nutritious leaves will be the young ones found at the top of the plant. 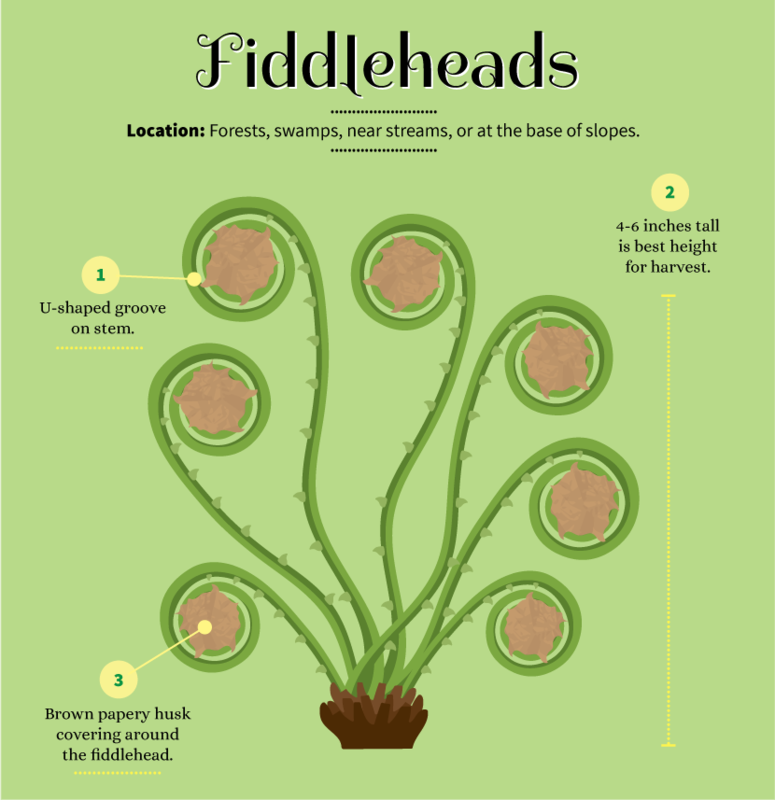 Fiddleheads are another great starting place for the learning forager because, as their name suggests, one only needs to keep an eye out for a plant resembling the head of a violin. 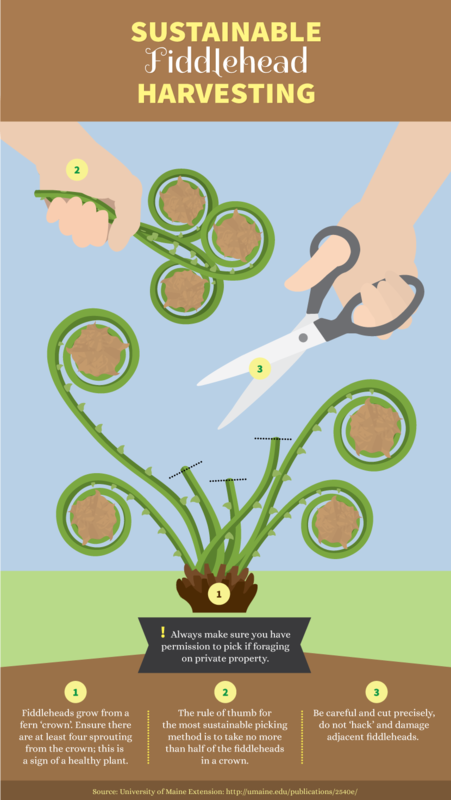 These funny-shaped plants are young ferns that have yet to unravel their leaves. Look for them in the spring when new fern plants are emerging. Like most ferns, fiddleheads can be found in the woods in places where plenty of moisture accumulates, such as swamps, near streams, or at the base of slopes. Identifying fiddleheads requires more time than the abovementioned plants, but it is a great skill to develop for any forager and is a confidence booster once you get the hang of it. Once you find a patch, you can return year after year to have a good chance of harvesting more. The species you are looking for is known as Ostrich Ferns or Matteuccia struthiopteris. Some other fern species are edible but are not as palatable, and other species are not edible at all. Two traits to look for when identifying Ostrich Ferns are the U-shaped groove on the inside of the otherwise-smooth stem and the brown, paper-thin scales covering each side of the fiddlehead. Harvest these plants when the fiddlehead is about 4–6 inches tall to get the best taste. Fiddleheads have a similar flavor profile to asparagus, and they make a delicious addition to any stir-fry or a standalone side dish. Frying them in butter is especially popular. To prepare fiddleheads, wash them with cold water and remove any brown bits. Boil or steam them for at least 12 minutes to prevent any soil-borne contaminants from entering your meal. Do this even before frying or sautéing so you’re always on the safe side! Here is a great guide for choosing the right oil for your fiddleheads. 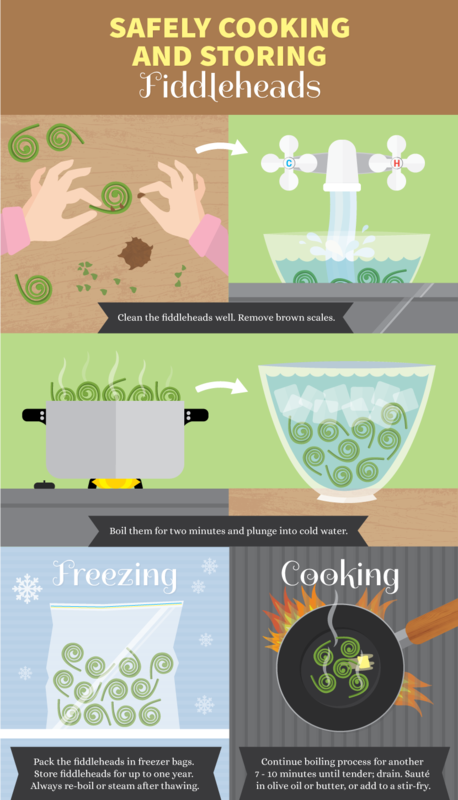 To save fiddleheads for the coming months, simply freeze them. The wilderness offers a cornucopia of edible plants that are largely overlooked. Incorporating these plants into your diet can help you incorporate a broader spectrum of nutrients and fibre that the modern menu often lacks. Foraging is a great activity to practice with friends because the excitement of finding a patch of a tasty plant is definitely contagious! Identifying these plants is the first step towards safe and rewarding foraging, and using a plant identification guide is always recommended for beginners. As foraging becomes increasingly popular, watch for workshops held by your local wilderness societies, colleges, or universities on how to practice sustainable, safe foraging. About the author: Mannfred Boehm is a botanist at the University of British Columbia, Mannfred researches the diversity of pollination in flowering plants. His passion for our photosynthetic friends has led him to explore avenues in agriculture, food policy, international development, and ecological conservation.